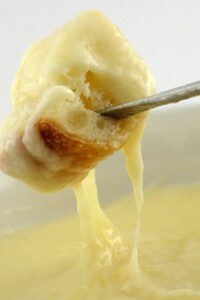 Quick and easy fondue recipe we created late one night while drinking wine! Haha! Warning, this is NOT an authentic fondue recipe. Your favorite dippers! We used unsalted pretzels. Combine all ingredients in a microwave safe serving bowl. Heat for 30 seconds, and stir. Heat for and additional 30 seconds, stir. Repeat until the cheese is melty and gooey.